Enjoy & have a nice meal !!! 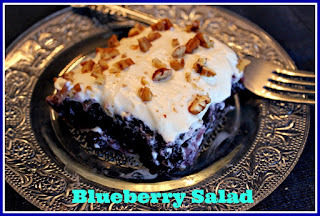 : Blueberry Salad! We always refer to this as "Aunt Mary's Blueberry Salad", because when we have a get together this is the salad Aunt Mary prepares most of the time, by popular request I might add. My Aunt Mary is my mother's youngest sister, and like all of my mother's sisters, she is a really good cook also. Mix gelatin and boiling water until it dissolves. Add in the crushed pineapple with it's juices and the pie filling. Pour mixture into a glass baking dish. Chill for at least 2 hours or until it has set up. Mix together cream cheese, sour cream, sugar, and vanilla. Spread over the gelatin once it has chilled and set up. Sprinkle the top with chopped pecans. You can put this in a gelatin mold, but if you do, don't add the topping until you unmold it onto your serving platter. We always do it in a baking dish.